The US Federal Reserve may launch a new bond-buying stimulus programme at the start of next year, released minutes have revealed. The minutes showed that "a number" of the Fed's senior officials want to see a current bond-buying scheme, dubbed Operation Twist, replaced. Under Twist, which expires in December, the central bank has been selling short-term Treasury bonds and using the proceeds to buy longer-term bonds. The aim is to cut long-term loan rates. By buying longer-term bonds, the Fed has been pushing their price up, and lowering the interest rate or yield. This then has a knock-on effect on the long-term interest rates offered on bank loans and mortgages. First launched in September 2011, the Fed is spending up to $267bn on Twist. 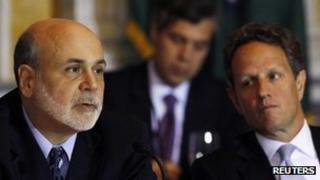 The Fed is also continuing with a third round of quantitative easing (QE), which was launched in September of this year. Under QE a central bank pumps fresh money into the economy in an attempt to boost lending. Under the third series of QE it is buying $40bn of mortgage-backed bonds per month, for an open-ended period. The Fed had previously spent $2.3tn over two rounds of QE. The minutes of the October meeting of the Federal Reserve's top Federal Open Market Committee also showed that it reaffirmed its commitment to keep the main US interest rate on hold at near zero until 2015. The US economy has shown recent signs of growth, with official figures indicating that it expanded at an annualised rate of 2% in the three months to the end of September, more than had been expected. However, unemployment remains high. While the US economy added 171,000 new jobs in October, the unemployment rate rose to 7.9% from 7.8% in September, as more workers resumed the search for jobs. The Fed itself warned last month that US unemployment remained "elevated".